After a very successful ‘Write your 2017’ contest last year, Sweek is back with the second edition of this inspiring writing contest! At the end of each year we take time to reflect upon our life and to make plans for the upcoming year. With a little bit of creativity you can transform your contemplations into an adventurous sci-fi story, a thrilling mystery or an epic love story. Look for inspiration around you! Already have plans for New Year’s Eve? Turn them into an exciting adventure story! Are you starting a new study soon? You might meet a handsome classmate on your first day and get tangled up in a passionate romance! Whatever your 2018 brings – let the words flow and create a story about it! Fiction or nonfiction, poetry and prose, as long as your entry is related to the upcoming year of 2018! The story needs to be newly uploaded on Sweek. #My2018Feedback is open for all #My2018 stories! Help your fellow writers get even better! For each language, the Sweeker who leaves the best critique receives $20. How to join? Step 4. You can participate as many times as you like until 6th of February 2018. You can participate even if you didn’t write a story on the topic! Congratulations to these authors who made it to the top! We chose them because of the writing style, originality of the story or its unexpected ending. Thank you to almost 500 participants (in English only) we had. Good luck in the upcoming contests! 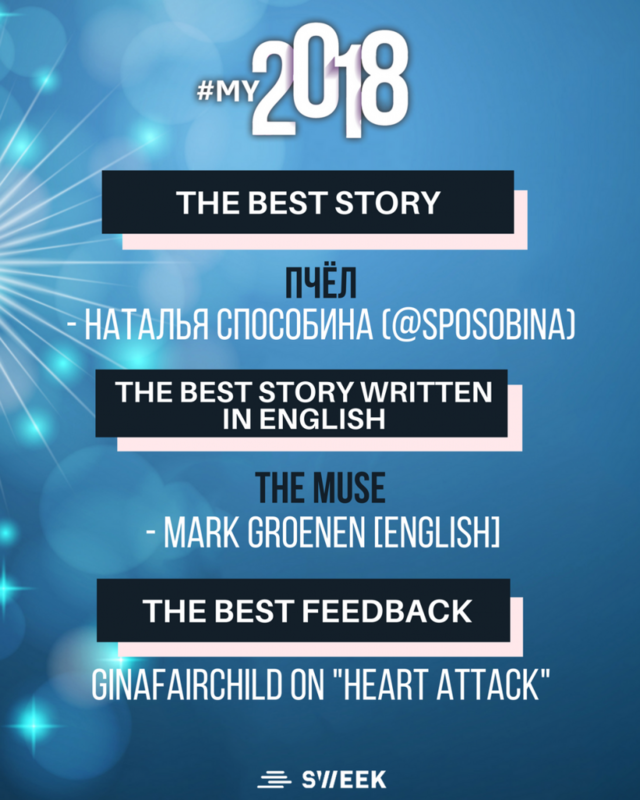 “The Best #My2018 Story” title goes to a Russian writer, Natalia Spososbina. Kyril, the main character of “Pcyol” is a perfectionist and a workaholic. He doesn’t prioritise time with his family and struggles with finding time for his beloved ones. To somehow break out the working routine, he starts reading a blog of a photographer and adventurer. He dreams about reaching out to him and getting to know him better. Time goes by and his dreams remain to be just dreams… until Christmas comes. This day changes Kyril’s life and brings him a new resolution for 2018. The famous blogger happened to be his own brother, that he never had time for in real life, however, he spent hours scrolling through his blog. “The Muse” by Mark Groenen was chosen to be the best one written in English. Congratulations to this Dutch writer! We really love the idea behind the story and its surrealism. We also received many comments to compete in the “Best Feedback” category. @GinaFairchild left a couple of helpful comments but the one on “Heart Attack” caught our attention. Once more – thank you to all the participants and congratulations to all the winners and finalists! How is the MyFeedBack judged? Is it by how helpful it is, how detailed it is, how many feedback comments you make in total, etc? It will be judged based on how detailed the analysis of the story is as well as how meaningful, powerful and helpful your feedback is for a writer. Yes, all genres will be accepted (so both poetry and prose). What is topic of competition ? Your story can be about anything. The idea behind #My2018 is that you should write about anything that happened to you or might happen (e.g. your plans for the future) but it has to have some literary fiction added to it. Hi, is there a chance of getting my story published in paperback if I write a really captivating story of 5000 words? I will include a prologue, bit of poetry at the beginning of each chapter and would commit myself to it until February deadline. Honest! Unfortunately, this contest does not offer any publication. Hi, if I am from malaysia and i want to submit my application for the competition will it still be valid? If your entry is in any of the participating languages - you can submit it. :) It is a global contest, open to everyone. The story doesn't have to be just 1 chapter, right? No, it can be more. Can I join even if I am a Filipino? What if someone from a different country say China, India or Japan wins the prize how will it reach to them?? If you send us your e-mail address linked to your PayPal account - we will make a transfer. If I don't have an account in PayPal??? How will you transfer the money??? It's free of charge, you can create it with ease. This is our only way to transfer money to different parts of the world. I registered my story fwa in Mumbai in 2015(story in Marathi language) . can I participate this competition. You can win the prize by winning either in 'the best story' or 'the best feedback' category. The contest is open to anyone who is more than 13 years old. Which tense should I story be? Also, what are the minimum chapters which should be included? The only restriction is the limit of 5,000 words max. in terms of length. You can write as many chapters as you wish as well as use tenses which you consider to be aligned with what you want to write about and how. In this case, we would contact you and find a convenient solution. If I choose Poetry, Maximum How many words it should has??? There is only one limit - 5,000 words for both poetry and prose. Is it possible to submit both Poetry and Prose ?? Or we should submit any one? I have several Christian poems already written (hand written). Will I be able to use these particular poems? They are all based on special events that actually happened. Are these poems suitable for submission? I Just created a blog, but I have to complete it with my poems. Hey! How to add tag on already published story? By editing 'Story Details'. You can find this option by clicking on your story and then on 3 dots menu available on 'Story Dashboard' in the upper-right corner. To enter, please follow the steps given below. Is poetry an acceptable entry? Yes, you can enter either with poetry or prose. Can i write poems . Yes, you can write either prose or poetry. Unfortunately, this contest is not available in Hindi. You can participate in one of the following languages: English, Spanish, Portuguese, Dutch, German, Polish, Turkish, Russian. Hi! Just wondering, must the story be completed within the word limit (5000)? Yes, it has to be completed. How can I submit my my poem???? Like a normal story, just choose 'Poetry' as a category in 'Story Details'. You can submit your work only in the following languages: English, Spanish, Portuguese, Dutch, German, Polish, Turkish, Russian. When results will be announced? Hey, is it necessary for the genre of the story to be adventure, sci-fi or romance? I want to write a general fiction. Is it okay? General fiction is also okay. You can write about anything you want. Just add a fictional layer to any of your story - it can but doesn't have to be inspired by your life. Yes, everyone is welcomed to participate as long as the story is written in one of the following languages: English, Spanish, Portuguese, Dutch, German, Polish, Turkish and Russian. The whole idea of the contest is to write about the future, not the past. If the period of 80s inspires you - it's fine to include it in your plot, however, you must somehow link it to 2018 (maybe use retrospection?). So are we allowed to do anuthing, is there a fee, and if we win how would we get the money? Yes, you can write about everything as long as it's aligned with 'My2018'. The contest is free of charge and you would receive the prize via PayPal. If your younger than thirteen, can’t you still submit a story under parent approval? Just choose a 'poetry' category as your genre and publish your poem as a normal story (just keep in mind to put it as a chapter, don't write the whole poem in a description). Is it necessary for the story to be linked with my life? & Can I write it in third person pov? If it's related to 2018 somehow - yes, you can do it. No, it's not necessary. However, if you have more than 25 followers, you will get a special badge that you can use for the covers and your profile picture. Unfortunately, the languages of the contests do not include Hindi. Hey, could you please check whether my story is qualified for the competition in case of deadline. This Ms Martha is rili patient. jeez! I can't help skipping some of the questions... Guys! just read the submission guidelines twill help save Ms Martha ur stresss biko..
Hi! I would like to know how are the stories judged? What are the criteria? Is there a jury who'll evaluate each story? Yes, there is a team who will be judging the stories based on the following criteria: writing style, originality and plot development of the story. The results will be announced today via our Social Media channels at 5pm. There will be also an e-mail sent to all the winners. I am Aditya from India. I have posted 2 stories for the Writing Contest: #My2018! Are the results released? Will the results be displayed on the official page? We always post the results on our official pages on Facebook and Instagram on a results day. On the following one you can expect e-mails to be sent to the winners and finalists. The blog post and the story with competition guidelines on Sweek will also be updated. Yes, they are posted on our Social Media (Facebook and Instagram). E-mails to the shortlisted authors will be sent soon as well as this post and story on Sweek will be updated.